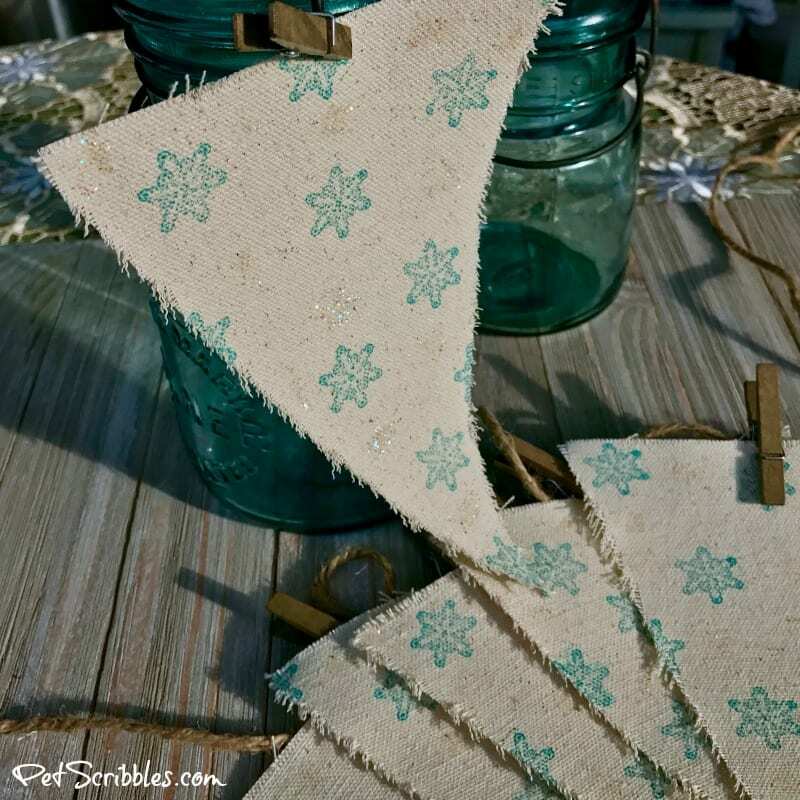 It’s time to create a bit of farmhouse decor: How to make a sparkling snowflake banner! 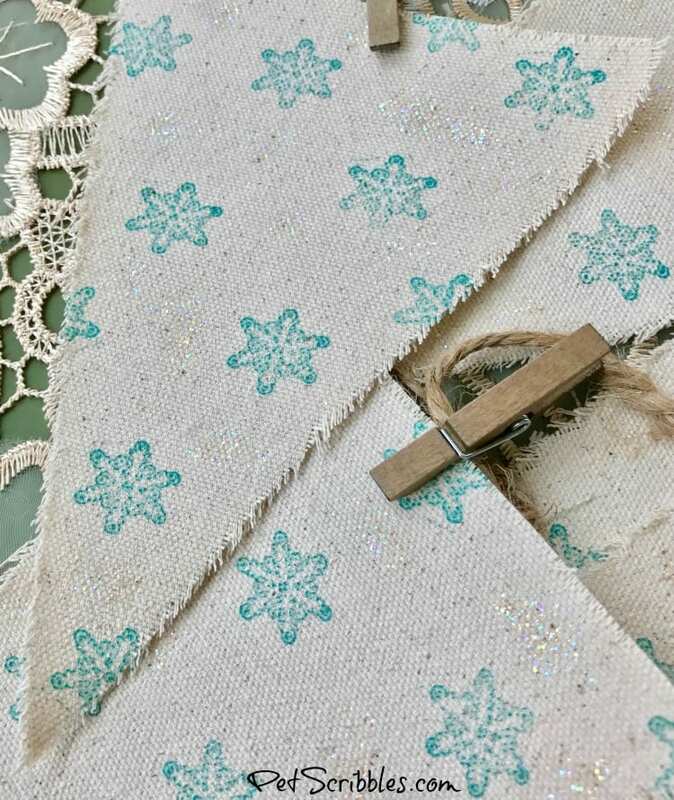 Create the look of festive vintage fabric with a snowflake stamp, ink and just a hint of sparkle! 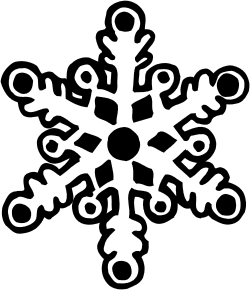 This snowflake banner can be enjoyed throughout the holidays and Winter season! Every year I try to make something that will not only work for the Christmas holiday but that I can keep out and displayed for the rest of the Winter season. 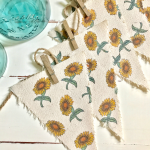 When I made the farmhouse sunflower banner for the Fall season, I knew I’d want to make something similar to enjoy all Winter long. And that’s how this project came about! 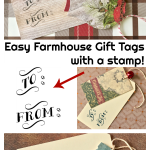 This snowflake stamp from Simply Stamps is available as either a self-inking stamp — like the stamp I used in my Farmhouse Gift Tags tutorial — or as a stamp with a wood handle. If you choose self-inking, you also have a choice of 8 colors. 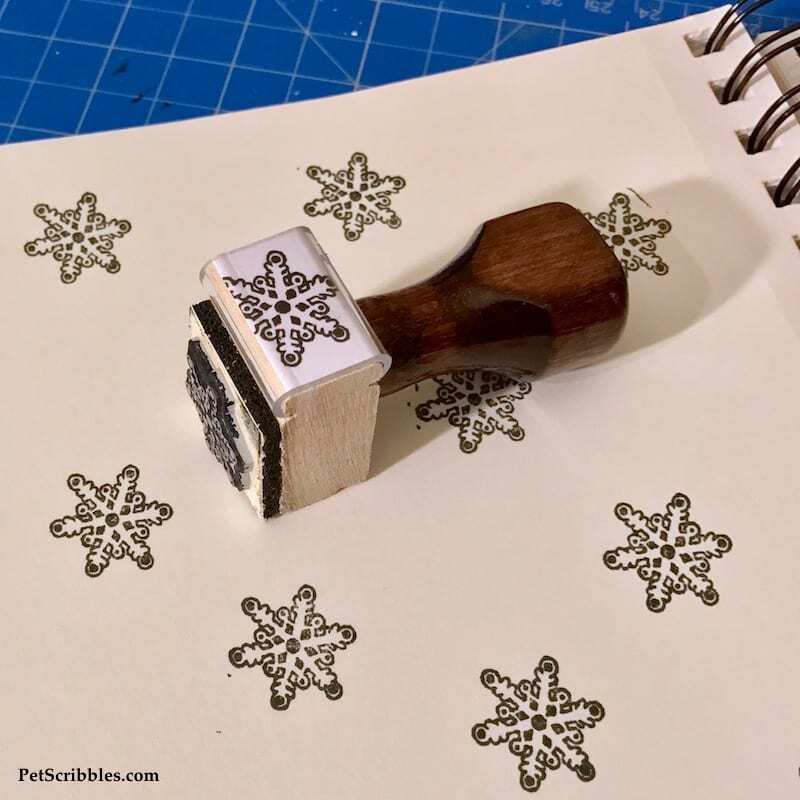 And — as with all of the stamps handcrafted by Simply Stamps — the snowflake stamp design is available in multiple sizes. I selected size small — which is .6825″ — and also chose having it made with a wood handle. 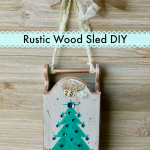 The wood handle is nice and feels comfortable, especially when stamping over and over again! 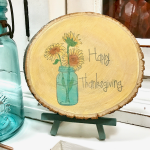 FTC Disclaimer: I’ve received products/compensation as part of the Simply Stamps Design Team. 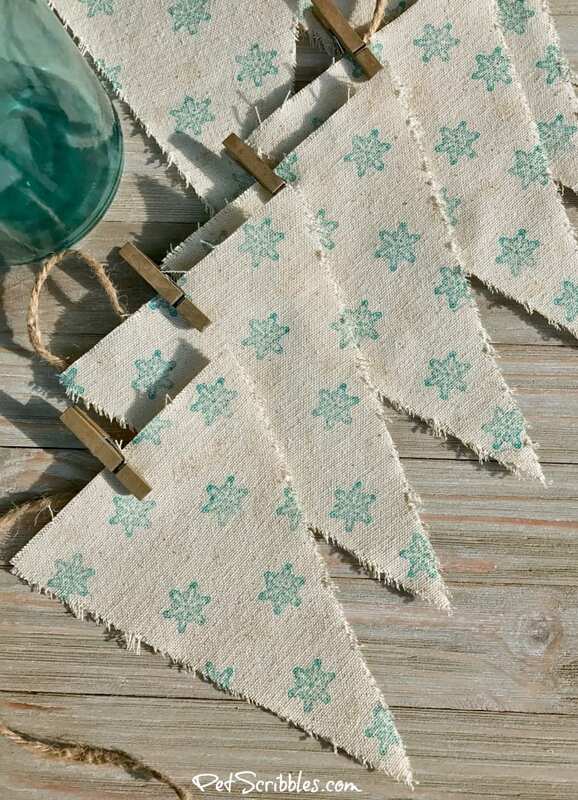 This sparkling snowflake banner, however, is 100% my own project! Some of the links in this post are affiliate links. I explain more here. 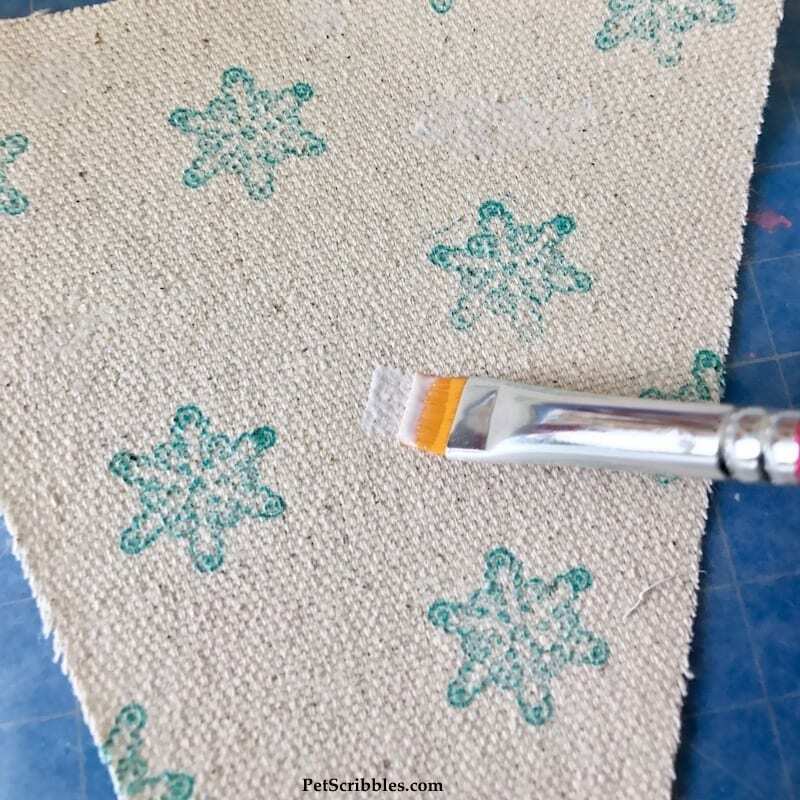 Step One: Practice stamping on canvas — it’s very different than stamping on paper or wood. I know I always mention to practice first, but this has been helpful for me. I keep a spare piece of canvas around just to try out stamps to see how they look. Here are the canvas pennants from Canvas Corp. I found them at Walmart in the craft aisle! 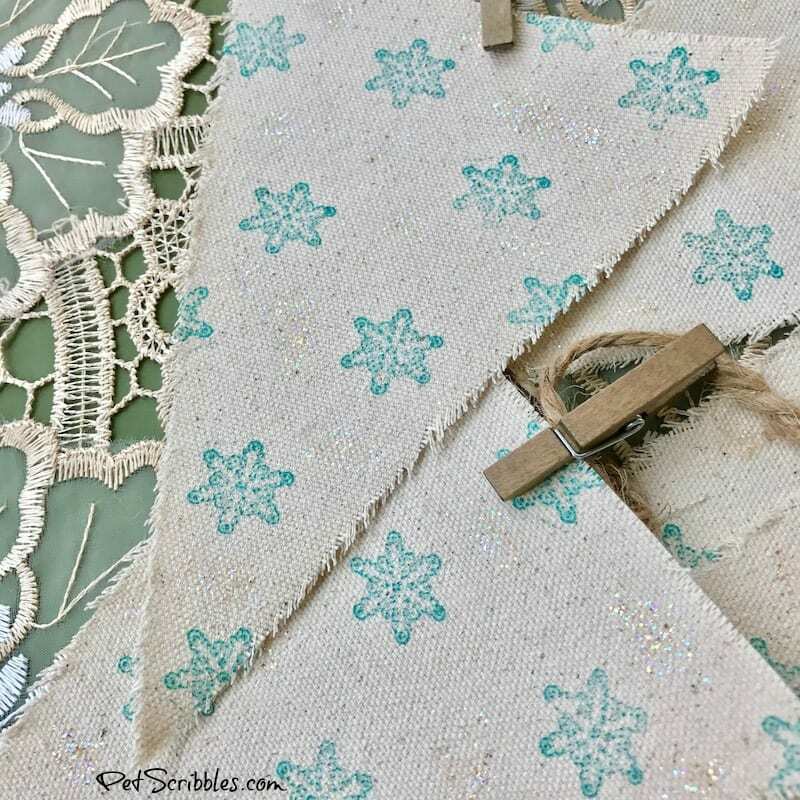 Step Two: Stamp the snowflake design all over the front of each canvas triangle in a random arrangement. 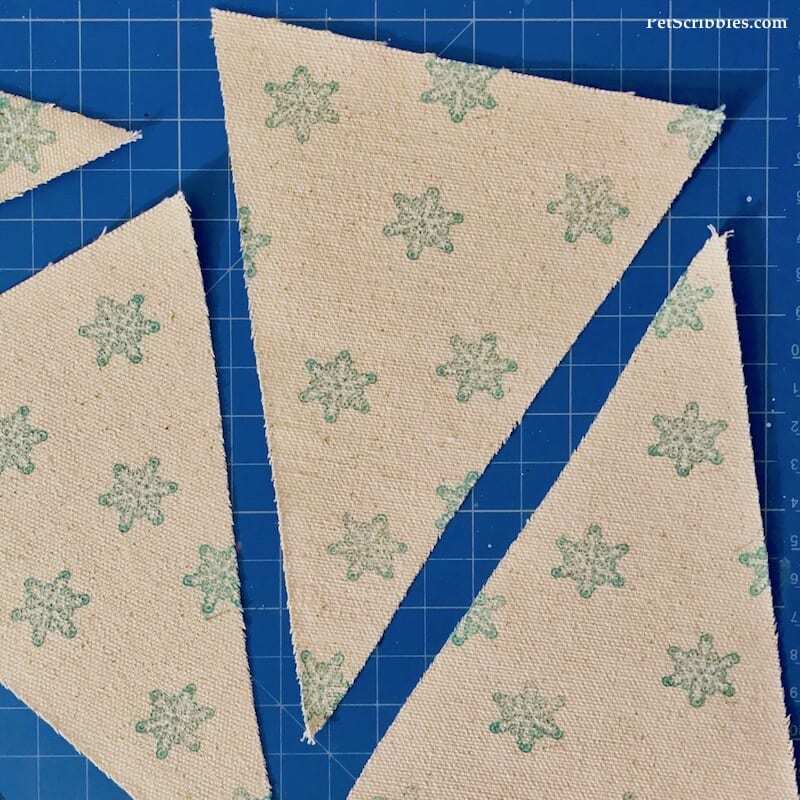 Don’t forget to stamp “partial” snowflakes onto the edges of each triangle. 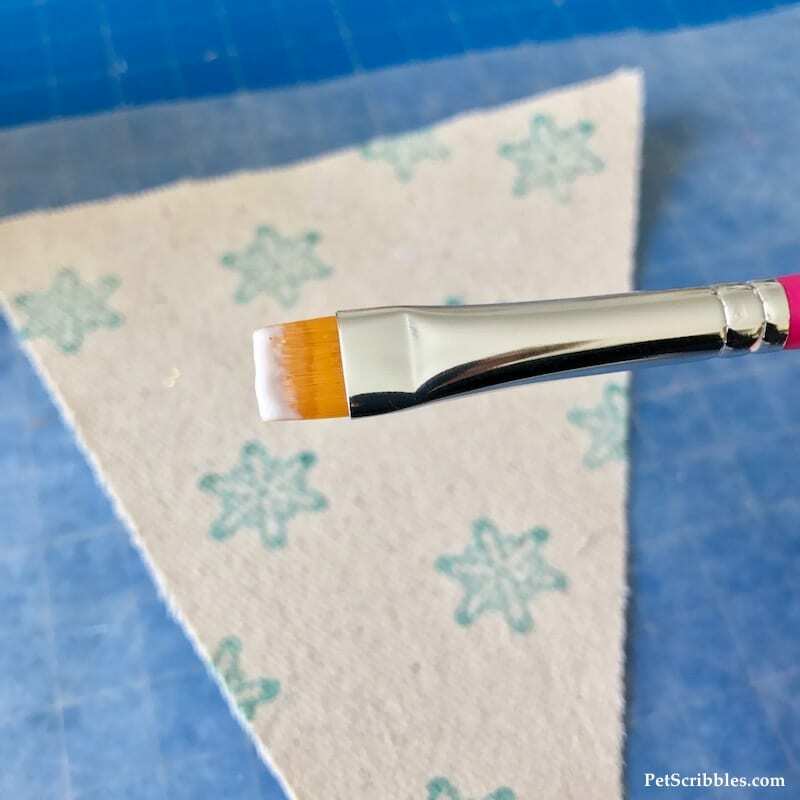 Place scrap paper underneath when stamping partial snowflakes, to avoid ink getting on your work surface. 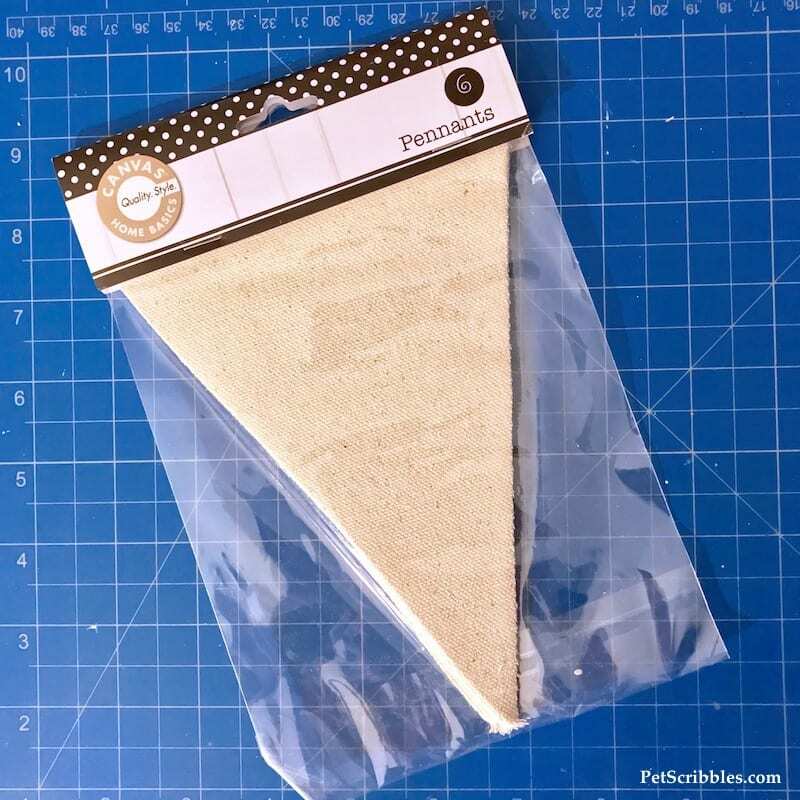 Step Three: Add some sparkle to each canvas triangle using Sparkle Mod Podge. 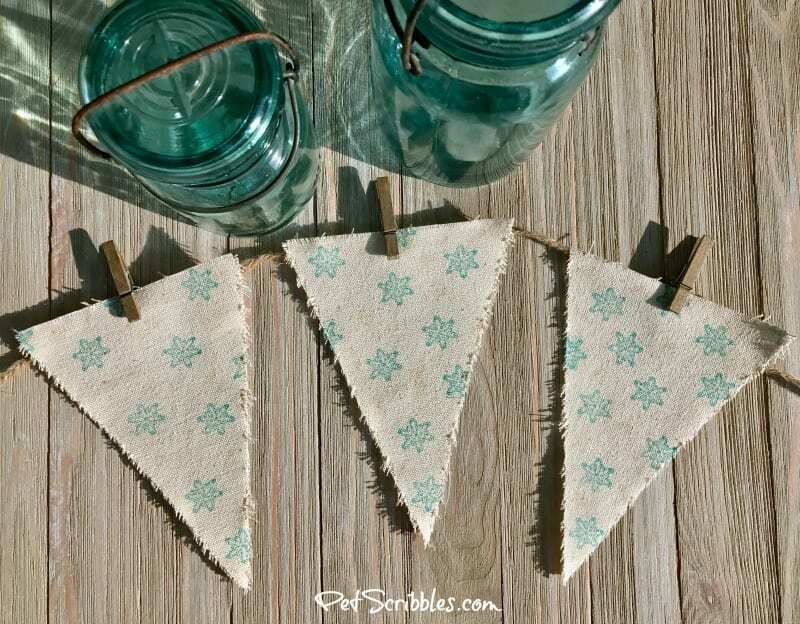 A snowflake banner should have some snowy sparkle to it, but as this is a farmhouse-style banner, I wanted to add just a bit of sparkle here and there. Using a small brush, I painted and dabbed tiny amounts of Sparkle Mod Podge in between the stamped snowflakes. Step Four: Distress the fabric edges of each triangle. This step is optional, but really adds to the farmhouse look. 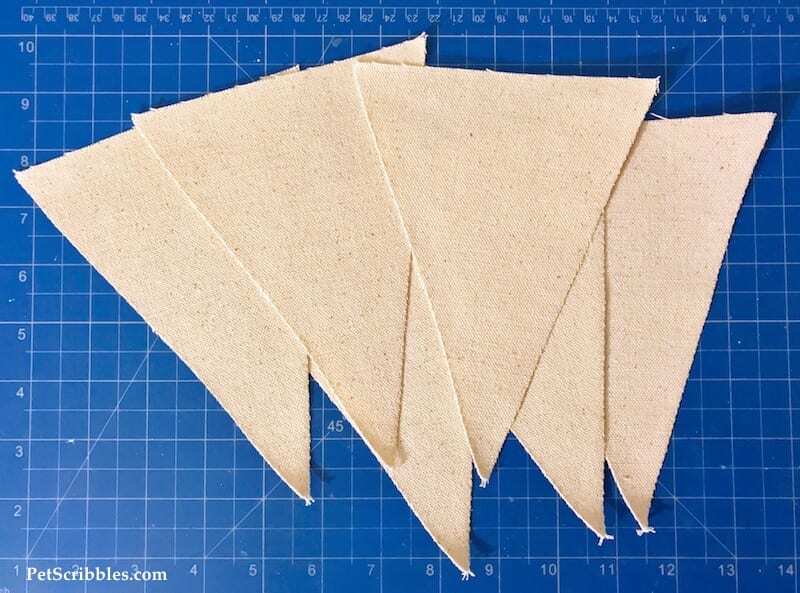 These canvas pennants have raw edges, which makes this step super easy to do. I used my fingers to gently rub the edges and the fraying happened almost instantly as I went around each triangle. For any frayed bits that are too long, just trim with scissors. 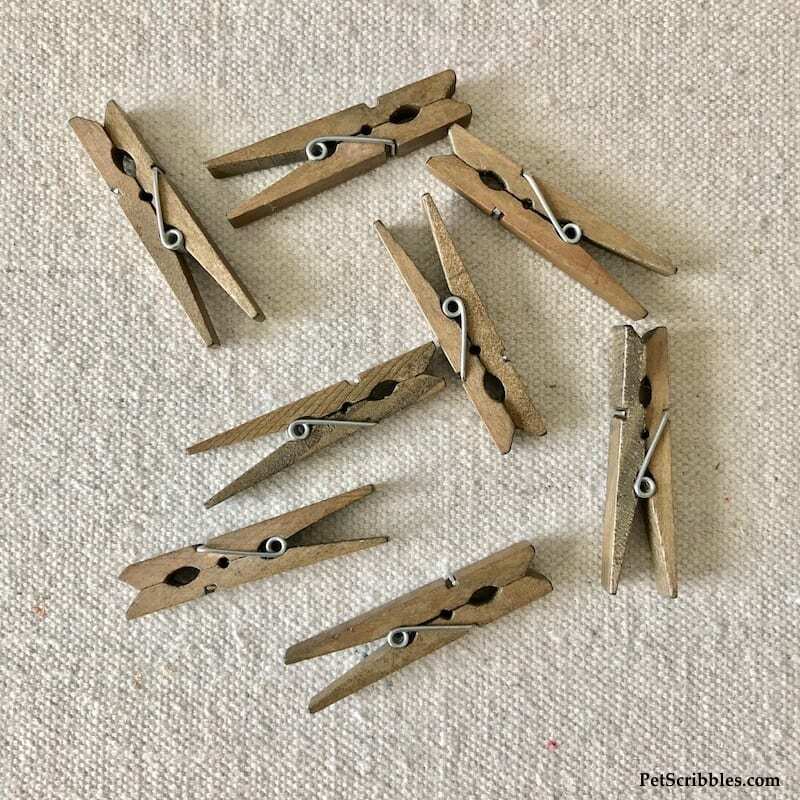 Step Five: Attach each triangle to a length of jute twine using the rustic-looking clothespins. Now you have a sparkling snowflake banner! In fact, you can’t even see the sparkle in some of these pictures! 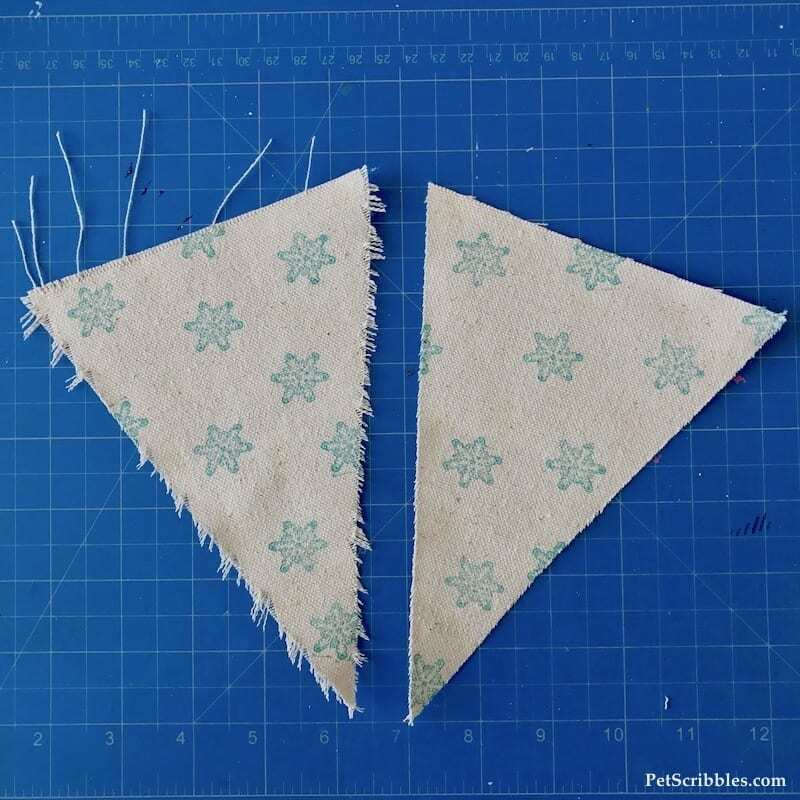 These fabric pennants look like they’ve been cut from vintage fabric! 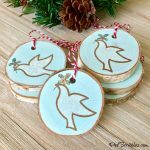 There’s still time to order stamps from Simply Stamps to make your own Christmas crafts and holiday decor — as well as get your Christmas gift shopping done. 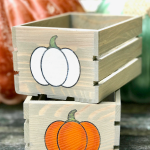 Simply Stamps is offering free shipping with no minimums right now — so head on over to their online store!